...... All designs only need simply three step. *Easy to use, only Three steps create Audio DVD. *Convert all audio file (MP3, WMA, WMV, WMA, etc) into DVD format and playable on your PC. *Choose from much professional menu background designs. Create DVD menu automatically. *Real-time preview your design right on your computer. *Digital pictures in PNG / PSD/ JPG / GIF / BMP / TGA / TIF formats and more. *Save/load your project, and edit it anytime. *Freely add/remove/modify/arrange Title and Chapter. 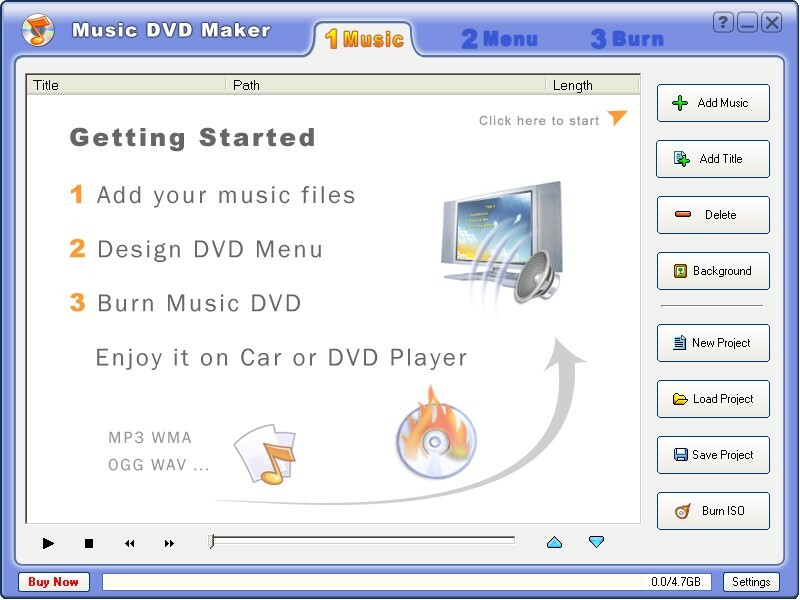 *Make DVD and VCDs for playback on TV and computers. *Support creating image file and dvd folder. Qweas is providing links to Music DVD Maker 2.57 as a courtesy, and makes no representations regarding Music DVD Maker or any other applications or any information related thereto. Any questions, complaints or claims regarding this application Music DVD Maker 2.57 must be directed to the appropriate software vendor. You may click the publisher link of Music DVD Maker on the top of this page to get more details about the vendor.